one thing both me and my partner know we want is a candy buffet!! 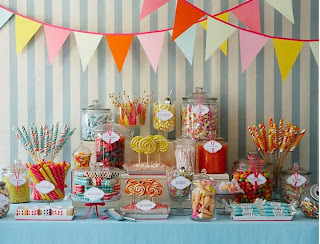 Whilst there are many companies that will do this candy buffet for you, we've made the decision to put together out own. We're going to get candy from the cash and carry, buy vintage jars from car boots and decorate them with ribbons! Alone with hiring a chocolate fountain, candy buffets,are becoming more andmore popular... this is great as there's loads of inspiration and advice to be found on the web and retailers have definitely cottoned onto this vintage style and so jar's and traditional sweets are easily found on the high street!